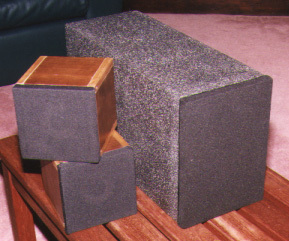 As part of my on-going attempt to use up "stuff" I've collected over the years, I'd deciced to build a three piece mini speaker system consisting of two mini satellite cubes and a bass module. The system would be used in a non-critical setting with a less-than-ideal setup such as a kitchen. High SPL is not required. The goal is to create something usable, cheaply, without placing much emphasis on overall quality. Net audio quality will nonetheless likely be on-par with similar mass-market systems selling at higher prices. The main parts I wanted to "recycle" were a pair of 4 inch Kenwood car speakers left over from my old car. For the box, I had various decently sized pieces of 5/8 inch particle board suitable for the bass module and smaller pieces of MDF for the cubes. Leftover grill fabric, veneer, and crossover components make up the rest of the spare parts list. The 4 inch car speaker is a 4 ohm Kenwood unit of unknown model. I've had these driver for over 10 years and they've served their purpose well in my old car. After my car stereo was stolen, I removed these since the new stereo only powered the rear speakers. These drivers have a "whizzer" cone and a silver-colored dust cap. They sound about as good as cheap "full range" car speakers can sound, which is not a whole lot better than your average low budget boom box. The woofer is a "special" from Parts Express. This is a 6 inch dual voice coil shielded driver by Pyle with a coated paper cone. The specs include : Fs = 56 Hz, SPL = 89 dB, Vas = 0.46 cu. ft., Qms = 7.98, Qes = 0.44, Qts = 0.42, Impedance = 8 ohms per coil, cost = $17.50. I didn't care for the shielding, which wasn't very good. Overall quality was acceptable. I wanted to keep the crossover as simple as possible. Since the speakers would primarily play the role of creating ambience, why spend the time to get everything just right ? It just wasn't worth the effort given the quality of the components in use. My starting point was a 10 mH iron core inductor and some electrolytic capacitors left over from an old subwoofer passive filter. I installed the inductor in the bass module and took measurements. I then measured the cubes and noted that their response fell from about 160 Hz. This is a bit high to avoid directionality but it would have to do. With some experimentation, I came up with a second order low pass filter consisting of a 10 mH inductor and a 100 mfd electrolytic capacitor. The high pass was only a 160 mfd (actually 100 + 50 + 10) electrolytic capacitor which combines with the driver's natural rolloff. Each cube is an MDF box sized just big enough to hold the 4 inch driver. The external dimension, excluding the grill, measured (in inches) 5.5 wide, 5.5 high and 5 deep. The grill added another 5/8 inch to the depth. All panels are glued and screwed together. The interior seams are caulked. The four side edges are removed and replaced with solid poplar, lightly chamfered to soften the edge. The sides are veneered with imbuya - a wood with a walnut-like look - and finished with danish oil and polyurethane. The grill consists of a piece of plywood with the center removed. Grill fabric is stretched over the frame, then stappled and hot glued on the reverse side. The entire grill is subsequently hot glued to the baffle. No provisions are made to allow removal of the grill other than to pry it off the baffle. Hot glue is not all that strong and much easier to deal with than trying to add ball & socket connectors that won't have room to fit ! The bass module was made of 5/8 inch particle board (MDF would have been better but I only had small pieces which were used on the cubes). The exterior dimensions in inches are 18.25 deep, 10.25 wide and 7.25 high. This gave an internal volume of about 0.5 cubic foot, not counting the port and driver volume. Like the cubes, only glue and screws holds this box together. Inner seams are caulked but there is no internal bracing. The driver is recess mounted to fit flush against the baffle and is located off-center so that a 1.5 inch (inside) diameter cardboard port tube can also be mounted to the baffle. The port is slightly longer than 2 inches. A grill similar to the ones used on the cubes is used for the bass module except that ball & socket connectors are used for easy grill removal. 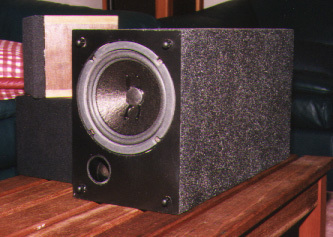 On the rear of the unit, an 8 terminal speaker cup is mounted to provide left and right channel input sand high pass filtered outputs for the cubes. All crossover components are mounted inside the bass module and can be accessed by removing the terminal cup. Prior to applying the finish, I sealed all cracks and voids in the particle board with wood putty. I also used the putty to even out some misaligned joints. For the finish, I first sprayed all sides with flat black Rustoleum brand spray paint. This is my favorite spray paint as it adheres very well to all types of surfaces including particle board. For the four large sides, I sprayed on Krylon's two-part "Make It Stone!" finish in Obsidian. Obsidian is black with white specks for a granite look and feel. The first part gives the color and texture while the second part is a clear protective topcoat. The front and back only had the original flat black paint but they too got the clear topcoat. The overall effect is quite nice and best of all, it's very simple and quick to apply. Measurements taken from a Radio Shack SPL meter showed the combined units to be flat (+/- 3 dB in-room) from about 63 Hz to 1600 Hz. Then to about 4000 Hz, there is a 3dB rise, some of which is probably due to the baffle step. Between 5000 Hz and 8000 Hz, response rises another 3 dB and has a distinctly "whizzer cone" sound. I considered removing the "whizzer" cone but if I didn't do a clean enough job with the knife, it would probably have sounded even worse. Luckily, the sound was not harsh. Besides, I reasoned that once in use, the chance of actually listening to the cube inline with the driver was small thus its effects would be much less noticeable. Clearly this is not a sonic masterpiece by any means but it will do nicely for cheap, non-intrusive sound with decent bass. And therein lies the main difference between it and the mass market cube + air-blowing bass modules. Whereas this bass module is a bit larger at 1/2 cu. ft., it also delivers quality bass. There's no wind noise or boom so often found in compact systems today. So for a total cost of about $25 - mainly for the woofer and spray paint - I now have a mini system that sounds fairly decent. Two factors made me update the cubes - they were ugly and my wife liked the granite look on the bass module. Since I still had about one third of the granite spray left, I sprayed the cubes to match the bass module. Goodbye wood look, hello matching set !